"You want what?" my wife said when I asked for the turkey neck as she was preparing the Thanksgiving meal. This slide was made from a bone in the turkey neck, a couple of small pieces of wood, and a couple of beads. The turkey neck was boiled in water until the meat and bones could easily be separated. I let the bones dry then selected one for the slide. 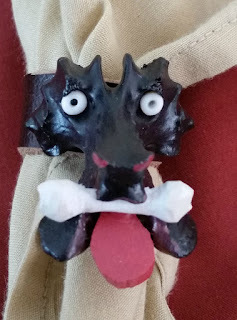 Getting out the craft paint, I painted it black and while waiting for it to dry I carved the tongue and bone from some pine. These were also painted with craft paint and set aside. With all parts dry, I super glued the bone, tongue, and the bead eyes in place. A couple of coats of poly to seal it and then it was ready for the loop. The loop is a piece of leather with a screw into the back of the bone to finish it up.